Tilted Horizons: Pro Hill Climb This Weekend! Pro Hill Climb This Weekend! 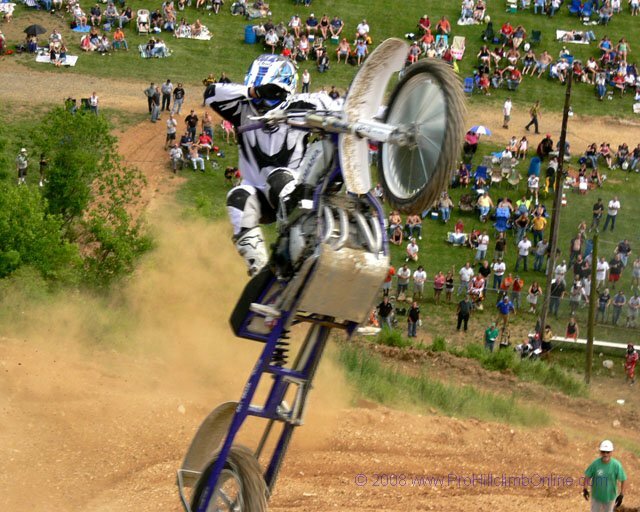 This Sunday, June 7th AMA professional hill climb returns to the 300-foot hill at White Rose Motorcycle Club's facility near Jefferson, PA. I've attended this event a few times previously and I hope to make this one. If you've never watched a real hill climb, you should. It's one of the oldest forms of motorcycling competition, and also one of the toughest...and most basic: fastest to the top wins (or furthest, if the hill beats everyone). A couple of jumps on the way up make it even more interesting, particularly as the riders are usually on the very edge of control as they blast up. Those who crest the hill with momentum to spare take a final huge leap. The first rider launches at 12:30 PM, rain or shine. It's easy to plot a nice twisty, back road route to the event. More event info on the club's website.